July, 2016, Taipei - Advantech, a leading embedded computing solution provider, today announced the release of its new, low power, fanless, Qseven CPU Module–the SOM-3568; and also the state-of-the-art, Qseven Rev. 2.1 reference development carrier board–SOM-DB3520. SOM-3568 comes equipped with the latest 14nm Intel® Pentium® and Celeron® N3000 series processors, which lower TDP to 4W/5W/6W for better power savings and less heat, yet with high performance. With its onboard memory and onboard eMMC storage capability, SOM-3568 is suitable for small form-factor, battery powered, and ruggedized applications infields such as industrial automation, medical, military, and portable instruments. SOM-3568, featuring low-power Intel® gen 8 graphics integrated in the SoC with up to 16 execution units, provides two times the graphics performance of previous generation platforms, and supports the latest DX11.1, OpenGL 4.2, OpenGL ES 3.0, OpenCL 1.2, plus hardware acceleration for VP8, VP9 and HEVC/ H.265 codecs. In addition, SOM-3568 provides next-generation 4K display resolutions via various display interfaces e.g., LVDS, eDP, HDMI, and DisplayPort, and allows triple simultaneous independent content displays. SOM-3568 integrates a rich array of I/O interfaces including 4 PCIe x1 ports (without GbE) or one PCIe x4, up to 3 USB3.0 and 5 USB2.0, and LPC for legacy expansion interfaces. It also provides high bandwidth, onboard, dual-channel DDR3-1600 capacity for up to 8GB of system memory, and optional onboard storage with eMMC 4.51 specifications providing integrated, rugged, space saving storage at an attractive low cost. These sufficient I/O interfaces on a highly integrated system make the SOM-3568 ideal for portable and ruggedized applications. SOM-DB3520 is a new, Qseven Rev.2.1 development board, designed in a Mini-ITX (170 x 170 mm) form factor. 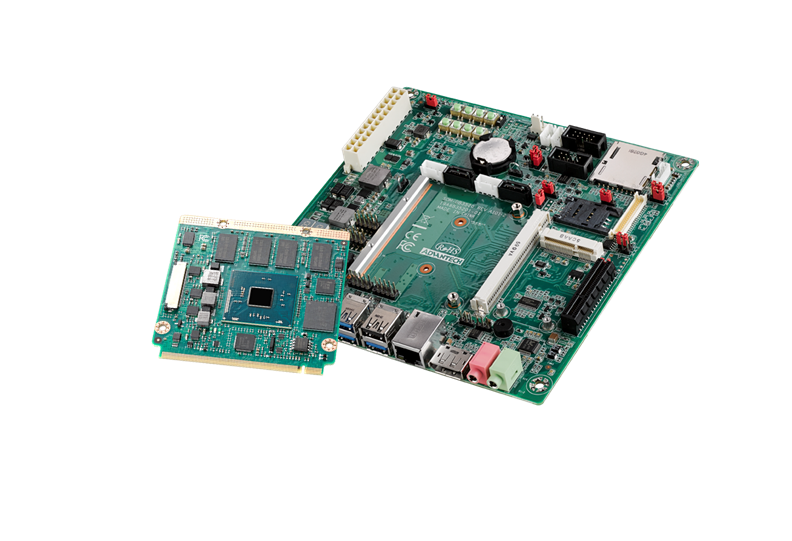 It features compatibility with Qseven 2.1 modules, and assists customers in emulating functions while developing their own carrier boards. SOM-DB3520 has multiple expansion interfaces to meet various customer requirements, such as 1 PCIe x4 slot (may be used for PCIe x1 via a riser card), 1 Mini-PCIeslot w/SIM socket, 1 GbE, 1 SATA, 1 mSATA, 3 USB 3.0 and 8 USB2.0, 2 COM ports, 1 SD socket, TPM, CAN Bus and HD audio. The SOM-DB3520 also provides flexible alternative power options, such as standard ATX power supply and 12V DC-in adapter to satisfy diversified application scenarios. This carrier board has low profile I/O connectors, suited for both standard I/O shielding or low profile I/O shielding, and can fit into any standard or slim Mini-ITX chassis to meet most environmental requirements. Customers can emulate required functions on SOM-DB3520 as a reference design board, or sometimes customers integrate the SOM-DB3520 directly into their product as the application board. SOM-3568 and SOM-DB3520 will be available in Q3 2016. Please contact your local Advantech sales rep or visit the website (http://www.advantech.com.tw/embcore/) for more details.